Winter has blown in with a convincing dusting of snow and frigid winds. This morning I woke up to a beautiful dusting of wet snow that stuck to all the trees. The ground itself was largely too warm still for anything to stick to it resulting in a beautiful sight: lush green grass still carpets my yard while the trees wear a frosty coating. High water is the theme across middle Tennessee today. 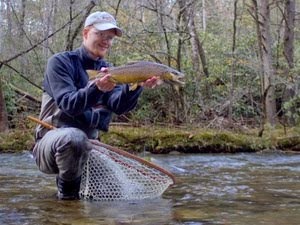 Rivers like the Caney Fork are high and look to remain that way for an extended amount of time. Upstream, Great Falls Reservoir is dumping a lot of water right now, like 59,398 cfs and still rising. All that water will end up downstream in Center Hill Lake which means it will eventually will come on down through the tailwater section. The Cumberland Plateau region and much of east Tennessee is under a flood warning as many small streams have burst their banks. Needless to say, fishing will be on the back burner for a while as water levels return to normal. The exception to this will be with the anglers chasing large fish. For those in the know, this might be one of the best times to chase a trophy. Last week, I got out for a one night camping trip that was supposed to be the start of a several day adventure. Well, plans change and I ended up cancelling the backpacking portion of the trip due to some unexpected extenuating circumstances. The campfire was epic enough to count for 3 nights worth of camping though. 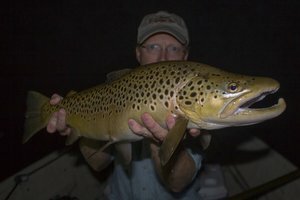 The recent heavy rain across Tennessee (at least by normal fall standards) has increased generation releases on area tailwaters. That means that the rivers that host stripers are killer right now if you want to chase the big fish. 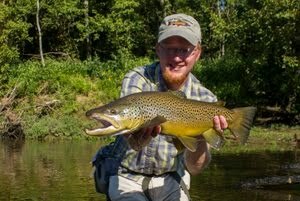 I have seen nice fish on several rivers but the action won't last too long. Once the water temperatures drop enough the stripers will migrate downstream to calmer waters for the winter. At that point, varous steam plants across the state will come into focus as striper hot spots. All the fish I've caught lately have come on my PB&J shad streamer. This fly continues to produce well for stripers and also pulls in walleye, largemouth bass, catfish, white bass, hybrids, drum, and just about anything else I throw it at. The following striper was caught fairly recently and ran about 130 feet before slowing down. After the initial run, it turned around and ran straight at me all the way to my feet! Talk about a smart fish...thankfully the hookset was solid, and after a good fight, I was able to get a couple of pictures of the nice fish. I never realized how much I enjoy having a nice DSLR around, but ever since the mishap a couple of months ago, it has become much more apparent that I really enjoy taking pictures. Recently, a friend loaned me their camera for an afternoon, and I had a blast just messing around outside my house. Here are a couple of the results. Or anywhere on the Colorado for that matter? If you have every fished Lees Ferry or the Colorado River downstream, the National Park Service is currently drafting its Glen Canyon Dam Long Term Experimental and Management Environmental Impact Statement. Over the past few years, the Park Service has been working more and more to restore native species wherever possible. 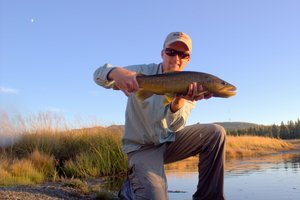 In the Colorado River, this means trying to reverse the decline of the humpback chub to the detriment of the rainbow and brown trout in this amazing fishery. Unfortunately, the problem with using means to remove the trout is that it completely ignores the fact that the Colorado River is an environment forever altered by Glen Canyon Dam. 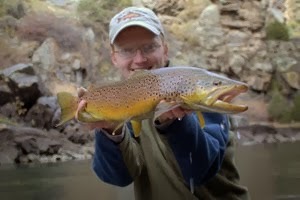 These fish would be struggling regardless of whether or not trout are in the river, because they are not used to the water chemistry and temperature now constantly flowing through the Grand Canyon. As the EIS is being formulated, the public is encouraged to send in comments to help shape the document. I have already sent in mine, obviously in support of the wild trout. If Glen Canyon Dam was going to be removed, then I would not have a problem with managing the river for native species. However, the fish that are flourishing are perfectly adapted to the new conditions. Killing all the wild fish won't alter the fact that they are best suited to the cold clean water now flowing through the Canyon. If you have ever enjoyed fishing or hope to fish Lees Ferry or the Colorado River in the Grand Canyon someday, I hope you will take a minute to send in your comments on this to the NPS. Just let them know that you care about wild trout and that the environment is the problem for the native species, not the trout.